The EU is relying on policy initiatives in particular areas. It needs to present an overarching SDG strategy. Why does this meeting matter? EU Commissioners Vella and Mimica will represent the EU at the HLPF. The meeting will review progress and make recommendations on meeting the Sustainable Development Goals, which the EU signed along with 196 parties in 2015. · Goal 17. Strengthen the means of implementation and revitalize the Global Partnership for Sustainable Development. The meeting will produce a Ministerial Declaration. The HLPF meets at Head of State level every four years, i.e. for the first time in 2019. Has the EU made progress on implementing these SDGs? For WWF, it is clear that despite committing to the SDGs back in 2015, the EU’s ambition on reaching the goals domestically is insufficient. Instead of presenting an overarching implementation strategy, the EU has relied on policy initiatives in particular areas, but even if these are all implemented, they are nowhere near enough to deliver on the 2030 Agenda. The EU continues its internal reflection on the way forward, while urgent action is needed to address the implementation gaps. “More than 1,000 days have passed since the adoption of the 2030 Agenda and the SDGs, but the EU still has no overarching plan for implementation. The EU claims that it is already delivering on SDGs in many areas, but if we look at the goals that are under revision this year, it becomes patently clear that there are considerable gaps that need addressing urgently,” said Sally Nicholson, Head of Sustainable Development at the WWF European Policy Office. 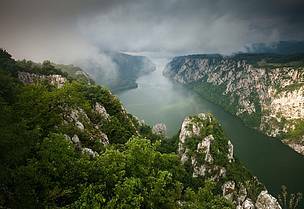 Europe’s freshwater ecosystems are in a shocking state, with only 40% of Europe’s rivers and lakes are in ‘good status’, according to a recent EEA report. EU member states have a legal obligation under the EU Water Framework Directive (WFD) to bring Europe’s freshwater bodies into ‘good status’, but since the adoption of the legislation in 2000, they have been failing to implement it adequately. The EU has just agreed disappointing 2030 targets for renewables and energy efficiency. The final deals were better than the Commission’s original proposals, but are still far off what the Paris climate agreement and the SDGs require. The 32.5% energy efficiency and 32% renewables target, both non-binding, are missed opportunities for climate action and a more sustainable economy, while new bioenergy rules will likely increase emissions compared to fossil fuels. Biodiversity loss threatens ecosystems and the human development that depends on them. Europe's rich and diverse heritage is at risk: only 23% of species and 16% of habitats protected under the Habitats Directive are in good health. Under the EU’s Biodiversity Strategy 2010-2020, all EU Member States committed to help stop global biodiversity loss, and put the EU Nature Laws at the core of achieving this strategy. However, the Birds and Habitats Directives are not adequately implemented, financed or enforced. “This reform of the Common Agricultural Policy post-2020 was announced to have SDGs as a cross-cutting priority that would reshape how we farm in Europe”, said Jabier Ruiz, Senior Agriculture and Food Policy Officer for WWF European Policy. “But instead, we are witnessing how sustainability in food and farming is being sidelined in the political debate, which would lead to reinforcing a system that continues to put farmers out of business and nature under ever increasing pressure”. To meet the SDGs in Europe and to meet Europe’s contribution to the SDGs globally, the EU will have to step up its ambition and will have to put its money where its mouth is. Proposals for the next EU Budget to 2027 barely acknowledge the level of investment that will be needed to achieve the 2030 targets of the SDGs and to support these environmental priorities in EU and globally.